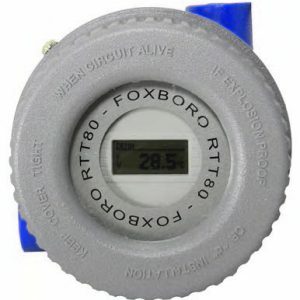 The Foxboro® brand Model RTT80 is a microprocessor-based temperature transmitter with HART® Communication Protocol. It receives input signals from thermocouples, RTDs, ohm, or millivolt sources. Registration to HART Protocol Revision 7 (HART 7) digital communications is standard. Available with or without SIL certification. One unit configurable for a variety of Thermocouple (TC) and Resistance Temperature Detector (RTD) inputs. Supports 2-, 3-, or 4-wire RTDs. Allows average or difference measurement. Hot sensor backup - switches to the second sensor if the primary sensor fails. Temperature-dependent switching between sensors used in different measuring ranges. Drift warning or alarm if the deviation between sensor 1 and sensor 2 is less than or greater than a predefined limit value. Galvanic isolation 2 kV input to output. Available as a basic module that can mount to a surface or DIN rail, or in explosion-proof universal or dual compartment housings for remote mounting, and integral sensor and thermowell mounting. Available with a wide selection of sensors and thermowells. Conforms to applicable European Union Directives (product marked with “CE” logo). Electromagnetic compatibility in accordance with all relevant requirements of EN 61326 and NAMUR NE21. Meets many testing agency requirements for hazardous area installations.